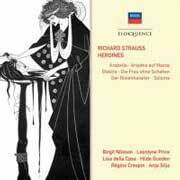 It is often said that Richard Strauss had a lifelong love affair with the soprano voice, and it is certainly true that many of his finest operatic roles were written with that voice in mind. In addition, the quality of his writing for sopranos regularly shows their instruments off to maximum advantage. Sopranos have genuine cause to the grateful to him. Collected here are some of Strauss’s greatest heroines – whether regal (the Marschallin in Rosenkavalier), demented (Salome and Elektra), or crafty (the Empress in Frau ohne Schatten). These highlights feature not only great solo scenes (the final scene of Salome, Elektra’s monologue) but also some sublime ensembles (Arabella, Ariadne auf Naxos, the closing scene of Rosenkavalier). The singers represent some of the leading Strauss sopranos of their day – Della Casa, Guede, Crespin, Söderström, Silja and, of course, Nilsson – as well as some of the great Strauss conductors: Solti, Böhm, Dohnányi. Many of the recordings were made by the Wiener Philharmoniker in one of Decca’s iconic recording venues, the Sofiensaal, over a period of some twenty years.